Whether a mouse gnawed through a wire, or some goofy technician failed to duck under some components, entertainment giant Disney had a company wide network outage earlier today. 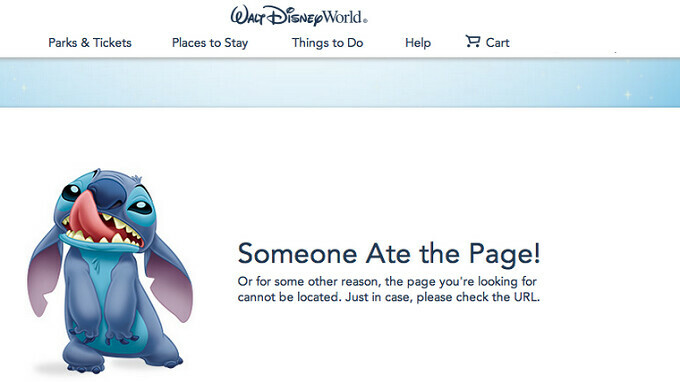 Disney being Disney, the effects of the outage were felt far and wide. At least two Disney mobile apps, including the recently launched Play Disney Parks, failed to work. And sports buffs had to endure a day without timely World Cup updates from the Disney-owned ESPN app. The outage also prevented guests at Disneyland and Disney World from making FastPass reservations, and using previously made reservations. Those awaiting notification that the room at the Disney Hotel they reserved was ready to be occupied, had to be informed via a phone call or face-to-face. And the websites for the parks in Anaheim and Orlando had to resort to a funny error message starring Disney animated character Stitch (see the image at the top of this article). Like all Disney movies, there is a happy ending. After nearly four hours of being down, the company finally was able to get its online network back up and running at around 7:50pm EDT.